Rented either as a 2-bedroom 2.5 bath junior penthouse on the 3rd floor of the St. Lawrence Beach Condominiums presents indoor/outdoor living at its most brilliant. A wraparound balcony suspended above the Caribbean seashore indulges with lounging and conversation areas, plus an oceanfront hot tub. Sink into muscle-soothing water while taking in a tropical panorama from what feels like the top of the world. On the other side of the glass, find an open, breezy indoor living area. A modern, elegant dining table facing the big ocean view, a plush lounge area coaxes you into long conversations, and a contemporary kitchen provides all the small and large appliances (in stainless steel) that you’ll need for preparing a meal to savor by the sea. Other than the hot tub, the sea views, and stunning indoor-outdoor architecture, this penthouse stands out for its flexible accommodations; it can be rented as either a 2-bedroom OR a 3-bedroom unit. If you don’t need the 3rd bedroom, just let us know and we’ll close it up and adjust the nightly rate accordingly. The main 2 bedrooms both face incredible wall-to-wall views of white-capped aqua waves skimming the pink shoreline. One bedroom lets you sprawl out with a king-sized bed; the other has a queen-sized bed. Both rejuvenate you with Caribbean furnishings and vibrant paint colors and fabrics. The St. Lawrence Beach Condominiums stand out because of the complex’s intimate size (just 17 units), small and lovely private beach with a private jetty—accessible only to condo guests and residents—for sunbathing or sea-watching, and a immaculately maintained oceanfront swimming pool surrounded by tropical landscaping. The famous St. Lawrence Gap, on the southern shore of Barbados is a favorite destination for both locals and tourists. Lots of quaint small businesses, including delicious restaurants, authentic shops, and more—all within walking distance of your condo. A car is not necessary; a taxi to and from the airport is likely all you’ll need. We are experts on all things Barbados, so feel free to ask about the must-see places and activities to explore during your trip. We know your holiday time is limited—I will do everything I can to help you make the most of it. Contact me today to learn more…or to book your dates in welcoming and beautiful Barbados. Another couple joined my wife, adult daughter and myself for a week at Sapphire Condos 101. Everything about our stay was excellent The unit was very nicely appointed, and we liked very much that it was on the extreme north side, so we have a broader view from our spacious balcony, where we spent a lot of our time. We had a great view up Dover Beach and were right above " Johnny Cool's" bar and restaurant. While it was more active than some units would have been, for our taste , we enjoyed the liveliness. This was a two-story unit, with one bedroom, bath and patio on the ground level where we entered, and the rest upstairs. There was a parking place right outside our door, which not having a car, we did not use, but it made going in and out of the condo even that much easier. To access the pool and beach, we simply walked around the corner and down a short sidewalk. We liked the security features of locked gates at the street and the beach, even though we felt safe everywhere we went. This is on the south edge of The St. Lawrence Gap, so it is in very convenient walking distance from about everything you would want. We found the property managers to be very responsive to our needs. The realtor representing the owners was extremely helpful in planning our trip, including sending us a 14-page self-made guide with about every topics, and contact information. We used a number of her recommendations, and were pleased with all. 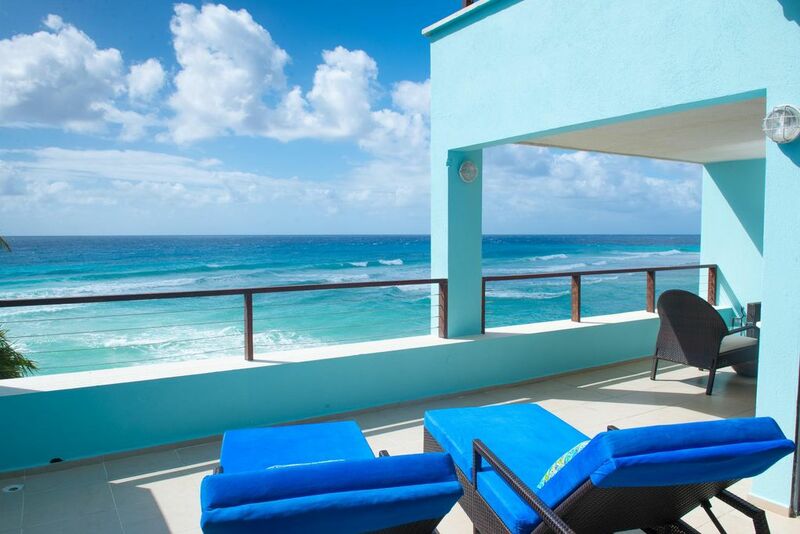 When we return to Barbados, we would definitely return to Sapphire Condos 101. Just like the pictures! A beautiful place to stay in a beautiful location! The Jr. Penthouse is beautiful! There is ample living space indoors and outside. The finishes are very nice. The outdoor patio is wonderful and has a covered portion so you can get a little relief from the sun and even remain outdoors when the island showers pass by. The views are amazing! The condo is in a very convenient location. There is no need to rent a car here, if you don't want to. However, there is free parking if you do choose to get a car. One note: if you're traveling as a family, the bedroom that faces the Gap (versus the beach) is not very large and is a better option for the kids. This should not be a deal breaker if you are traveling with all adults, though. You should be spending most of your time in the Jr. Penthouse living space, on the large patio or out and about in beautiful Barbados! Also, the team that works at the condos to handle your reservations (Jane) and take care of you during your stay (Ricardo) are top notch! You will be pleased if you pick this condo for your stay! I'm delighted you had a wonderful visit in Barbados! Thanks for your kind review. You are so so right about Ricardo; thanks for mentioning this wonderful staff member. Ric does everything in his power to help make every guest's stay splendid ~ and he can fix anything!! I thank you for writing and hope we see you again in beautiful Barbados! If any birthday warrants a celebration it's one's 40th! I'm delighted Barbados could be a part of your entry into a new decade of life :) I can see that you made the most of your time on our beautiful island. Thank you for your most lovely review. And I hope we see you in Barbados again soon! I traveled to Barbados with a group. Party of 5 and we fit so comfortably in this unit. I thought the views were spectacular, the balcony was a major highlight for us and everything was functional. The only thing preventing me from giving this a 5 star review was the Wi-Fi. It was just rough! You could barely get connected and we had to stand in one place to get the best service. We all ended up calling our phone providers and purchasing an international plan. I needed to work on this vacation so it was important for me to be "connected". Other than that, I thought Ricardo and Jane were welcoming and pleasant. I loved being next to the night life and in walking distance to dover beach. As for Barbados (I was not crazy about this island) I thought the US dollar didn't go far and most meals cost us around $40-50 bucks when dining out. I wouldn't go back, and if this condo was placed on a different island I would definitely stay in it again. I know you had trouble with the wifi! I'm so sorry about it not being up to snuff .. I work when I'm traveling and having reliable internet is vital. As you know, during your stay I had the connection checked by the IT company; they claimed they did what was needed. But I can see that whatever it was they did it wasn't enough. I do apologize for that. You're right about the costs, too. Almost every item we have on this island is imported, which contributes to the high cost of living in paradise. So Barbados is not a budget island, no. I am very happy to hear that you loved your apartment. I hope that when you reflect on your time here you remember the views, the beach, the gorgeous climate, and amazing location of your home-away-from-home! Thanks for choosing the Jr Penthouse in the St Lawrence Beach Condominiums for your accommodation while here. I had an amazing time at the beach condo. Two friends and I visited Barbados to celebrate my birthday. I was a bit skeptical about the pictures since they looked amazing, but to my surprise, the condo is everything seen in the pictures. The view is to die for, the condo is decorated in a modern contemporary style,--very clean and welcoming and it totally aligns with the beach. The view from both bedrooms was refreshing and relaxing. The kitchen has everything you need for a short or long stay. Restaurants, bars and entertainment is literally across the street from the condo. We spend a few nights partying at Jamm Inns across the street, it has live music and plays awesome music after 12pm. The crowd was great too. Their are plenty of beaches to pick from that's very close to the condo. Dover beach is a great one too. Jane has been a huge resource for information and readily available to answer any of your questions. It was such a pleasure communicating with her. Ricardo, the building manager was also a pleasure to speak to--he was able to provide insights, recommendations and any other answers that we needed. The only issue that we encountered was the spotty wifi throughout the condo. On the bright side, we got better reception from the wifi by the beaches (literally 2 beaches over from the condo) and by the pool. Overall, this was an amazing vacation, one of the best. Barbados has some of the best beaches and I've experienced quite a few in my lifetime. Definitely get to know the locals to an even better experience. I would definitely visit and stay at the condo again! Thank you for choosing the Jr Penthouse in the St Lawrence Beach Condominiums for your birthday celebration. It was such a pleasure having you and your sweet friends here in Barbados. Your comment that you weren't sure you could trust the photos being a true depiction of what you'd find here was exactly the worry I had the first time I visited Barbados ... Could it really be as pretty as pictured?! I wondered. Well, now you know .... the photos say it all!